Duncan Jones put on his poetry and cryptic hat and took to Twitter to tease the coming of the next film he is set to direct, and whilst everyone seems primed for the Marvel, DC and Image Comics of the world, the spotlight pendulum swings once more to shed light on Britain’s 2000 AD since we last heard of Mega City One. Yep, it looks like Jones will be bringing light to Rogue Trooper. The phrase “Zarjaz New Future War Story!” appeared across the top of the cover for the 228th issue of British comic anthology 2000 AD, teasing the arrival of Rogue Trooper. “Zarjaz” was a word that only made sense to the 2000 AD faithful — it meant “excellent” in the alienspeak of the comic’s mythology — but it wasn’t incorrectly used in this context; from that first seven-page installment in 1981, the future war dynamics of Rogue Trooper captured the hearts and minds of the target audience for the comic, and launched a property that continues to this day. The comic was co-created by Watchmen’s infamous Dave Gibbons and writer Gerry Finley-Day. The narrative depicts an ugly war between two human factions — the Norts (essentially Nazi-esque dirtbags from space) and the Southers. The fight takes root on Nu Earth, a planet ravaged by the war to the extent survival is impossible without the assistance of breathing apparatus and “chemsuit” armor. Seeking the edge, scientists from Southers’ “MilliCom” created a breed of seemingly unstoppable clones, called Genetic Infantrymen — G.I.s for short — only for all of them to be massacred upon their arrival on Nu Earth. 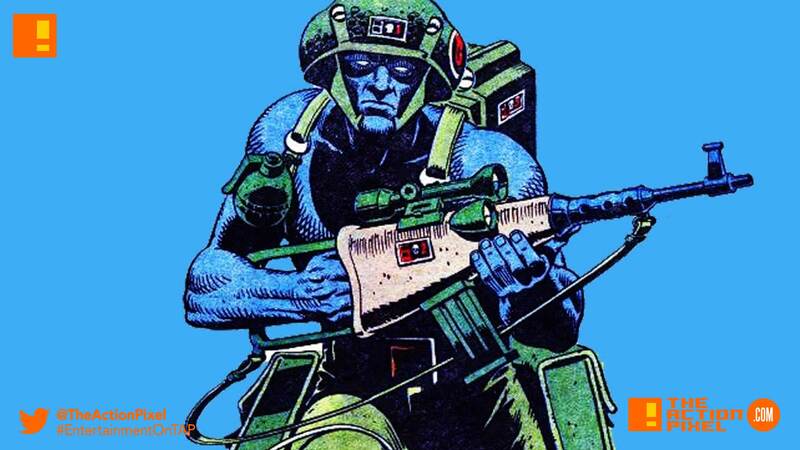 Only one survived – the Rogue Trooper – with a new mission: to find the traitorous Southern High Command general that betrayed the G.I.s, and kill him. Now this will be interesting to see on film for sure, the militant iconography made famous by the Nazis and the likes in line with DC’s New Gods / Apokolips, but whichever direction this film takes. Jones latest endeavours haven’t been all the way great with Warcraft receiving mixed reviews and his Netflix film Mute being lacklustre in my opinion, but it will be interesting to see where he takes this.